Gleann an Airidh Cottage is a beautiful detached cottage on Blackpark working croft providing high quality self-catering accommodation for family groups or individuals. Situated on a hillside overlooking Loch Indaal with magnificent sea views, Gleann an Airidh Cottage at Blackpark Croft is a short ten minute walk from Loch Indaal’s sandy beaches which are suitable for families with children. One large, well furnished living room with television. 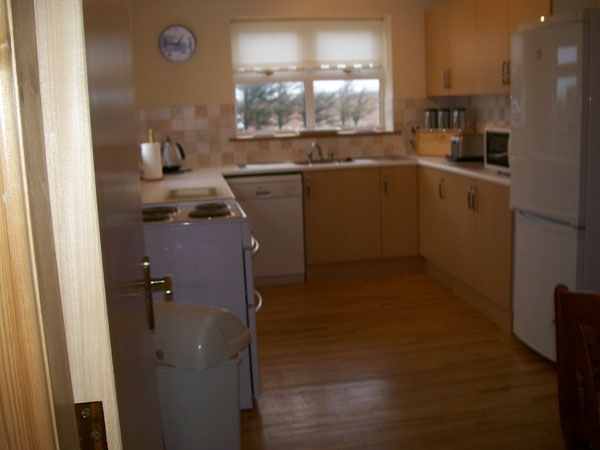 Spacious dining kitchen including a washing machine, tumble dryer, dishwasher and fridge. A high chair for a baby is available. Two double bedrooms one with a en-suite toilet, hand washbasin and shower suitable for disabled access. Two twin bedrooms. There is plenty of space within this cottage to sleep eight people. A baby cot’s is available. One en-suite shower-room and one family bathroom with toilet and hand washbasin. Towels and bed linen are supplied. Natural spring water supplies the cottage which is tested and approved. Oil-fired central heating can be supplemented with an electric fire located in the living room. Heating and electricity is included in the weekly rate. One dog is allowed, providing it is kept under strict control.